With a Service Awards Program from Select-Your-Gift, employees choose their own gift from a catalog - or online! 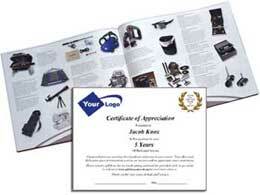 Years of Service Award Packets include many customization options, with No minimum order, and No contracts to sign. Employee satisfaction with their award is 100% guaranteed. There are many award levels to fit every employee recognition budget. You control your budget by selecting the employee award package-levels used for each of your corporate service anniversaries. If you're also looking for ideas for employee on-boarding gifts and retirement gifts, these are perfect! Upon requesting information, we will forward an actual Service Award packet and sample catalogs for you to see what the employees will get. You will also immediately receive a link to download the eBook: Guide to Employee Service Awards. In one easy to read, 36 page eBook, you'll get all the information needed to develop and implement an effective and successful Service Awards and Recognition Program in your organization. The gift catalog and presentation materials including: stationery, envelopes and closing seals, mail-in or online redemption instructions, toll-free order support, the selected gift, and the gift shipped to your employee anywhere in the lower 48 United States. Why Select-Your-Gift for your employee recognition? Select-Your-Gift is one of the largest employee service award companies in the U.S. We make recognition EASY! We'll help you review all available options to tailor a recognition program that exactly suits your needs. We will continue to support you and your program with a single point of contact, helping with every aspect of your program. Note: Do NOT submit if you're trying to REDEEM your own Service Award, click HERE if trying to Redeem your award!